With the Patch 0.8 Milestone comes a revamped and more detailed crafting research system. 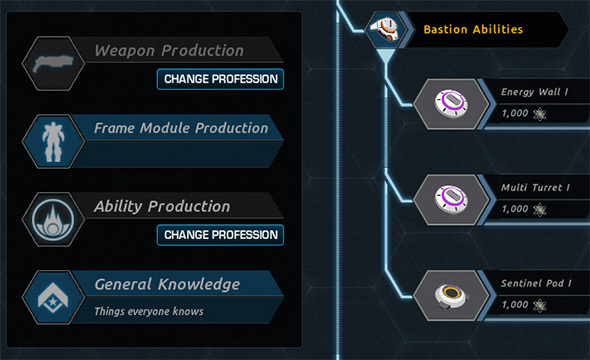 Research recipes are now divided into a range of professions, the research interface has been revamped, and you’ll need to collect research points to finish your research. You access the Research interface from the Molecular Printer. Select “New Job” on an empty printer slot, choose Research, and select one of the specialty areas to see research certifications. You can look around the research trees by clicking and dragging, and zoom in/out with the mousewheel. There’s a back button in the top left of all printer screens which will take you back a step. Note that you can’t currently look at Research (or any other printer job types) if all your printer slots are full. Crafting research falls into four basic categories, which are labelled “professions”. Weapon production: this covers primary weapons for all battleframes, and all five secondary weapons. Frame module production: this covers servos and jumpjets, as well as platings, passives and HKMs for all battleframes. Ability production: this covers ability modules for all battleframes. General knowledge: this covers personal and squad thumpers, refining (which includes blending) and health packs. It will also include inventory upgrades once inventory limits are implemented. These research trees are outside of the “profession” system and can be accessed by everyone at all times. You can change professions at any time in the Research interface with a cost that escalates every time you change, but you can’t research any recipes from professions you don’t have. If you change away from a profession and then return to it later, you’ll keep any research certifications you’d previously unlocked rather than having to start again from scratch. The cost of changing professions is based on the number of times you’ve changed in the last thirty days. Existing players who have already researched crafting recipes from multiple professions will be “grandfathered” into any profession where they’ve already completed at least one Stage IV research unlock. This is the only situation where you can have multiple professions at once, and you won’t be able to learn a new profession in future without losing access to the professions you were grandfathered into. Within each profession there are a number of research certifications to complete, in order to unlock more advanced recipes. Everything you can research has multiple levels — you need to unlock research steps in order, so researching Personal Thumper III requires you to research Personal Thumper I and II first. The research trees in the General Knowledge area are more diverse, ranging from two to eight levels deep. Starting a research job costs crystite and research points. Research points are a new resource gained by salvaging battleframe equipment (see our upcoming Salvaging guide for more information) — you’ll need them for researching battleframe equipment, but not for General Knowledge research. A research job in progress will occupy one of your Molecular Printer job slots until it’s completed, and it can be finished instantly by paying Red Beans. To start a research job once you have the necessary crystite and research points, find the research item in your profession area (or the General Knowledge area), and press the button with the “beaker” icon. This will start your research; once it’s finished, you’ll need to claim it from the job slots screen before you can research further along that tree. Research costs vary between professions, but within the same profession all items cost the same to research. General Knowledge recipes have varying costs, however. Note that crystite and time costs have not changed from the pre-milestone research costs. Personal and squad thumpers, refining/blending, health packs – 4 items. These items do not require research points.